Hello AEA! My name is Mona Fetouh and I work with OIOS-IED as an evaluation Team Leader. My colleagues have already described the overall process, scoping and methods involved in IED evaluations. How do we put this all together to develop evaluation reports that hold UN entities accountable and contribute to learning and institutional improvement? One example is an evaluation we conducted of the Executive Office of the Secretary-General (EOSG), in 2016-2017. This evaluation took place during the final year of the previous Secretary-General (SG) Ban Ki-Moon’s term, and an early version was presented to the transition team of the incoming Secretary-General, Antonio Guterres. As the office supporting the SG, EOSG plays a critical role in the UN system, by setting the overall direction and priorities for the organization and convening the diverse parts of the system to respond swiftly to development, humanitarian, peace and security and human rights issues. EOSG was very open to having our team come in to interview and survey its staff and partners, including the SG himself; observe high-level meetings of UN senior management; and access its documents and databases. As a process-focused evaluation, the team developed data collection tools based on business literature about effective meetings, decision-making practices, and strategic planning. We found that EOSG was a fast-paced, hard-working office that supported the SG well, but that there was little time or opportunity for longer-term strategic planning, and not enough prioritization of the SG’s busy meeting and travel schedule. 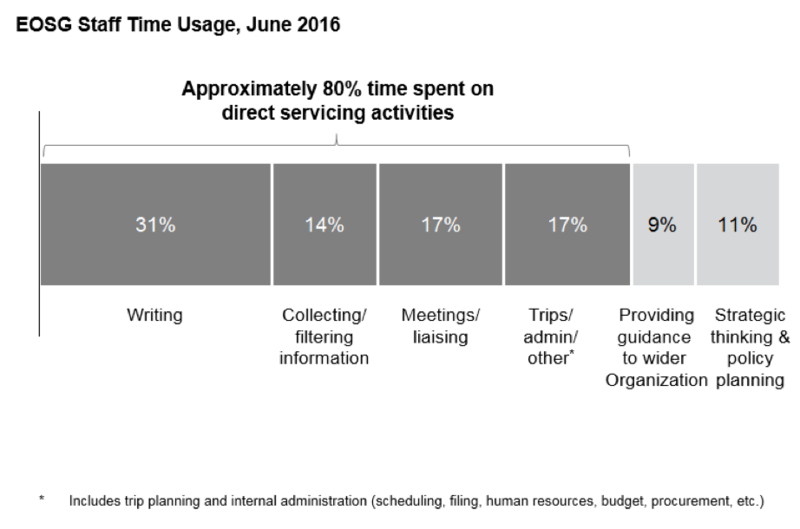 Senior meetings focused primarily on information sharing rather than decision-making, and the office faced challenges in sharing information across sections. In accordance with our findings, the transition team of SG Guterres took steps to address some of these gaps, such as creating an executive committee for senior-level decision making and establishing high level roles for policy and for strategic coordination. The evaluation was an example of how OIOS can help the UN improve its work, while holding even the most senior officials accountable. The openness of EOSG to the evaluation showed a true “lead by example” case of top-level commitment to evidence-based change. Rad Resources: OIOS’ evaluation report archive, including a download link to the EOSG evaluation.